At one point in Dark Fall: The Journal, the player has access to a character’s smartphone and can read his recent emails. One of them was a reminder to renew his membership to a Doctor Who fan club. I read this as the writer trying to show that this character was a bit of a nerd. After all, this game was made in 2002, three years before the show was revived, which means he was still an active fan — active enough to pay fan club dues — of a show that had been canceled 13 years ago. Lights Out was written by a different author, with a different perspective. [Correction: Both games have the same author. I don’t know why I thought differently.] Rather than mocking Doctor Who fans as nerds, he’s sending out dog-whistles to let them know he’s one of them. There’s a Sarah Jane mentioned in the historical materials in the lighthouse museum, as well as repeated mention of an oceangoing vessel called the Ribos. And of course the whole business of a glowing madman in a lighthouse is basically lifted from The Horror of Fang Rock. Apparently the Doctor even quotes the Flannan Isle poem at one point in Fang Rock. And even apart from these directly-referential details, much of the story’s shape so far just feels Doctor Who-ish. It starts with a period piece, then throws in a mysterious anachronism. Some of the best episodes of classic Who started the same way. It gives us the framework of a ghost story, but then starts giving the ghosts sci-fi explanations like time travel and possibly aliens — one document mentions a large cylindrical object falling from the sky. And it’s all about figuring out what’s really going on, which is a large part of Doctor Who‘s charm — much of the time, the Doctor’s initial motivation for getting involved in the story is curiosity. This, it strikes me, is a point where licensed Doctor Who games have generally fallen down, by focusing mainly on confrontations with well-known bad guys. Now, there are enough references to characters from Dark Fall: the Journal — most notably Polly White — to make it clear that this game takes place in the same universe, if not exactly the same timeline. And that makes the shift to the Doctor Who world-view strange, because the events of the previous game were pretty definitively supernatural, involving actual ghosts and evil spirits rather than time-travel and extraterrestrials. I suppose Lights Out could be about to retcon it all into rationalism, but that seems disrespectful. No, as far as I can see right now, we just have two coexisting stories, one about ghosts that are ghosts and one about ghosts that are not ghosts. Things took a major turn in my latest session. I finally found a cave that had been mentioned once or twice in the lighthouse keepers’ notes, with the aid of a map found in a locked drawer in a locked room — see, this is how to do hard-to-notice hotspots right. Let us pass them by, then tell us there was something we missed, and then, if that’s not enough, give us more explicit help. And what was in the cave? A tunnel through time. It’s daytime on the other side, and more importantly, it’s the future, which is to say, the present. This is not something I was expecting, even with the anachronistic disc I had already found. The lighthouse is a museum now, with a snack bar outside, some kind of exhibit about the island’s role in World War II, and bunch of plaques containing random facts about lighthouses and a truly excessive number of quotations from that Flannan Isle poem. Random objects that you were able to pick up and inspect back in the previous chapter are now behind glass and labeled. There are books in the gift shop about the vanished keepers — and one of the popular theories is that they were killed by the player character, Benjamin Parker. They don’t know that he was sent there to investigate disappearances that had not yet been made public; all they know is that he went out to the island for unknown reasons, and shortly afterward it was discovered that everyone was missing. Well, I had already learned that the man who sent him there was up to no good, and that Drake, the lighthouse keeper who went mad, was anticipating Parker’s arrival, but it’s unclear just what the scheme is. Maybe Drake knew Parker was coming because he had read the books too. He definitely knew about the tunnel. Also at the site is Polly White, one of the ghost-hunters from the first game. Nigel doesn’t seem to be with her this time. You can find her camera, which has a few selfies on it. They’re rendered in CGI, rather than as a scanned photo of a live actor like Nigel’s selfies from before, so presumably we’re going to be meeting her. This makes it seem like we’re supposed to be adding “find the lady” to our list of goals, which fits with the rugged seagoing Edwardian bishounen thing that Parker’s got going on to form a potential time-crossed lovers scenario. For the moment, though, Polly is hiding from me, because she thinks I’m a ghost. Which, given her vocation, also means she’s hunting me, observing me from distance. If she still had her camera, she’d probably be taking photographs. There’s one odd thing that the format does to that story. Your man-out-of-his-own-time is supposed to fumble with modern technology, be baffled and amazed by it as part of coming to terms with the unfamiliar (as a metaphor for the early stages of courtship). Parker, though, is under the control of the player. When you see a computer with a floppy disk drive, you know exactly what to do with it. The mysteries are elsewhere. Dark Fall 2: Lights Out (or Lights Out: Dark Fall 2; the game itself isn’t entirely consistent about this) isn’t a direct sequel to the first game. It shifts the setting from Dorset to Cornwall, and from the approximate present day to 1912. This time around, the primary setting is an ominous lighthouse, where three men disappeared without a trace one day, leaving nothing but “a door ajar, and an untouch’d meal, and an overtoppled chair”. 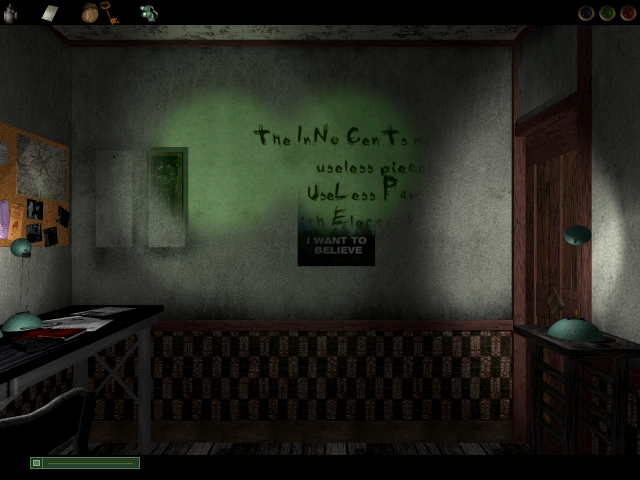 That’s a quote from The Ballad of Flannan Isle, which the game is loosely based on, and which it quotes liberally. The ballad is in turn inspired by a real event. The poem leaves the mystery unsolved, as it is in real life. The likeliest theories involve inclement weather and rogue waves and lack of proper safety precautions, but apparently there were more fantastical speculations at the time, involving things like ghost ships and sea serpents. Even the poem can be read as suggesting that the lighthouse keepers were turned into birds. The game, of course, comes down firmly on the side of supernatural explanations. Mysterious disappearances were the modus operandi of the Dark Fall back in the first game, and I’ve already found notes indicating that one of the three lighthouse keepers went mad and then started glowing. So far, I think I like this game better than the first one. It’s done a better job of conveying the story in its early stages, at least, creating a sense of mystery rather than of confusion, and the emphasis on atmosphere combines really well with the nautical theming. And it pulls some playful formal tricks. In the starting area, there’s a journal written by the player character, which contains a reminiscence about another place where he’d rather be than Cornwall. Reach that point in the journal, and the game shifts into a reverie, an interactive flashback, signaled by fuzzy edges on the viewport. I’ve found an inventory item in that state, and brought it back with me to the real world. I can believe that this is a bug, but right now, I’m inclined to see it as deliberate, especially considering how weird that item is. It’s the one concrete thing I’ve seen that suggests a link to Dark Fall: The Journal: a 3 1/2 inch floppy disc, labeled “Hadden Industries”. Yes, in 1912. Like I said: it’s wasting no time at creating a sense of mystery. 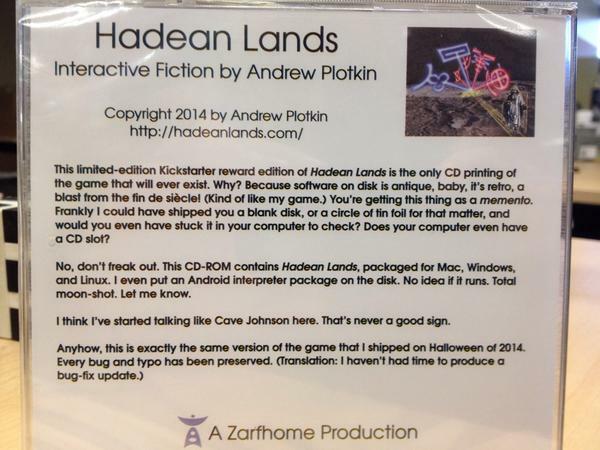 I’ve received the last of my Kickstarter rewards for Hadean Lands: a copy of the game on CD-ROM, which Zarf accurately identifies as more a memento than a medium, a token of a game you’ve probably already downloaded and finished by the time the discs were mailed out. Nonetheless, it is a game on a physical medium, and that creates some problems for the Oath. The Oath in its current form was written on the assumption that if I acquire any games on physical media, it’s because I haven’t played them yet. Taking the terms of the Oath strictly, I now have a CD that I duly played and blogged from start to finish while the Oath was active, but which went directly into the Trophy Case without passing through the Stack. This isn’t how I intended things to work. So I’m going to change the phrasing of the Oath slightly to recognize anomalous cases like this, and claim my self-granted reward for the posts I’ve already written. There’s one other iffy matter, though. 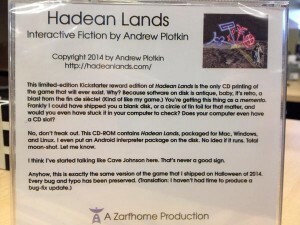 Hadean Lands isn’t actually the only game on the disc. It also contains a folder with 20 other games by Zarf — 19 previously released works plus one incomplete prototype. I played most of them to completion back when they were first released, but do the ones I haven’t completed count as on the Stack now? Even the ones I’ve completed are arguably in the same position as Hadean Lands itself. Ah, but there is in fact precedent for bonus text adventures on this blog. When I played the bonus text adventure included with Icebreaker, I didn’t count it as a separate game on the Stack, even though I did post about it. That very game is on the HL CD as well, and it would be strange to suddenly declare that it counts here but not there. And if it doesn’t, none of them do. I ultimately gave up and consulted a walkthrough to find the final missing word, apprehensive about accidentally reading spoilers for other things even though there really wasn’t anything left to spoil. It turns out that I had seen the word already. It was just presented in a way that was too subtle for me. And with that, I could conclude my part of the story, trapping the Dark Fall and freeing all the spirits it had been holding, in some cases for centuries. The closing cutscene shows them in the form of points of light, rising up through a peculiar funnel-like structure in the ceiling. Then it shows a number of changes happening throughout the site that seem to indicate that you freed them retroactively, making it so that the spirits were never trapped at all, there were no disappearances and no investigation. One of the more famous disappearances occurred in the 17th century, and is the basis of the a folk song that you can see framed on a wall; this vanishes before your eyes. So this can’t possibly actually be the same ritual that trapped the beastie in the first place, because obviously it wasn’t written out of history yet when you first arrived. I suppose it’s a good thing that they got to do a sequel, because there’s quite a lot left unresolved. My suspicions about Hadden Industries were never addressed, nor was the peculiar behavior of their equipment. I never did learn anything from talking to the ghosts that I didn’t also learn from documents. There’s some slight suggestion that the player character is dead and doesn’t know it — in the end, the player’s view seems to fly up through the ceiling with the rest of the spirits. But if so, your death is erased from history along with everything else. I’ll be continuing with Lights Out: Dark Fall 2 shortly, and keeping an eye out for answers. Overall, this game is actually a pretty satisfying specimen of its type, despite all my complaints. It’s got a good variety of puzzles, including a few that require you to put together information from both documents and the environment. I do think it would be improved by some way to highlight hotspots, though. And even that much would be inadequate for some puzzles. In most places, you can rotate the camera to face any of the cardinal directions, even if that means facing a blank wall. One of my last breakthroughs was realizing that there was a hotspot to go through a gap in a fence that I hadn’t actually looked at since my initial foray. Perhaps this is part of the author’s intent; perhaps making discoveries by assiduously searching every surface is part of the desired experience. But if so, I say there’s just too much of it. And there I go complaining again. Maybe I should just stop now and see if I can be more positive about Lights Out. I admit that my posts about this game have gotten a lot of small details wrong. For the most part, they’re not worth going back to correct, but there’s one rather large point I feel I need to set straight, incase it leads any future players astray. I said that, to perform the ritual that puts the lurking evil sometimes known as Dark Fall back into its cage, all I really needed to remember was the words, not the runes associated with them. This is sort of true: the ritual does only ask you for words. But noting which runes go with which words turns out to be crucial all the same. It turns out that the words have to be recited in the right order, and the ordering is given only in terms of runes. This is a slight inconvenience for me, because I had been taking most of my notes in a text file rather than a physical sheet of paper, and obviously I can’t draw the game’s made-up glyphs in a text file. I made this choice mostly because it accommodated playing in the dark, which seemed appropriate for both the game’s palette and its subject matter. When I found a rune, I turned a light on long enough to copy it down. But I stopped doing this when I thought it was unnecessary. And so I’ve had to go through the game and re-solve puzzles I had already solved to fill in the runes my notes were missing. And that occupied my latest short session. At this point, I have all of the runes, but I’m still one magic word shy of victory, and who knows how much random poking around I’ll need to do to find it? I suppose the next step is to try to remember where I found the one rune that I don’t have a word for, on the basis that the word, or at least hints for where to find it, it will be nearby. Once again, I wish I had taken better notes! I said before that the reveal-stuff goggles only work in some places. I think I’ve noticed a pattern to it. The goggles specifically work on spots that are in view of Polly and Nigel’s remote cameras. This is strange. There is no obvious reason for the two things to interact in this way. The cameras themselves do have a tendency to flicker briefly to the same alternate view that the goggles reveal, but I had taken that to be just a matter of the two devices responding to those spots in the same way. You might think that the cameras were specifically placed to capture the phenomena detected by the goggles, but Polly and Nigels’ journals attest otherwise: they just put the cameras all over the place, before they had any notion what the good places would be. Polly actually saw a spook in the women’s bathroom and regretted having installed the camera in the men’s. So why is it that the goggles reveal stuff in the men’s bathroom only? The obvious but strange answer is that the cameras are actually causing the stuff I’m seeing through the goggles. It’s worth mentioning here that all of this state-of-the-art ghosthunting equipment — goggles, cameras, computers, software the works — was gifted to Polly and Nigel by a generous patron, Hadden Industries, whose logo is an ominous omega. I’m guessing they have some sinister agenda, and that the cameras aren’t merely cameras. Possibly they want to weaponize the monster. In a different sort of game, that would be my first conclusion. Before I wrap up the rest of the game, I’d like to comment on its use of sound. This is a game that relies on sound a lot. There are puzzles that are solved entirely from audio clues — for example, there’s a secret compartment opened by pressing a sequence of buttons, and the only clue to the sequence is that the click of a correct button press is different from that of an incorrect button press. Even the various ghostly voices count as audio-only clues, I suppose, as the game doesn’t support subtitles, a failing that would be almost impossible to imagine today. But that isn’t really what I wanted to mention. It’s sound as ambiance that interests me here. There’s a large number of creaks, footsteps, snatches of song, and other noises that play at various times and places, usually pulled at random from location-specific pools. And they’re pretty good sounds, given the limitation of the recording quality. I assume the goal is to creep the player out, just like they would if you heard them when exploring an abandoned building at night for real. One thing that’s repeatedly mentioned in the game’s written matter is that the hotel’s lurking menace can be heard lumbering around on the other side of doors, and the very worst thing you can do is answer when it knocks. But I don’t think the sounds work very well for that purpose here. They’re just too frequent to produce that sense of nervousness — and, for that matter, too definite. A sound when you were expecting silence can trigger the greatest sense of apprehension, largely, I think, because the brain interprets is as a sign that you’re not actually alone — that you’re in the presence of someone (or something) who is being very quiet, and is therefore up to no good. But in Dark Fall, you’re basically never alone to begin with. There are ghosts, and they talk to you, and they’re mostly pretty friendly. There’s also the fact that you’re never really in danger, because the game mechanics don’t even support danger as a concept, but I don’t want to overstate that. There’s another haunted house mystlike I recall, called Amber: Journeys Beyond, which gave me severe creeps at the time, even though it too had no real danger. It just had things like a shadow that moved a little for no apparent reason and a background hum that suddenly stops. This only really lasted for the first half of the game, mind you. After that, you started dealing with ghosts in more concrete terms, which, as in Dark Fall, took all the scare out of it. There’s one sound gimmick that I find kind of interesting, though: the sound effects associated with some of the printed matter. Sometimes you’ll be reading someone’s diary, and a page will mention, say, a knock at the door, or a train pulling into the station or something. The sound of the thing described will play when you turn to that page, after enough of a delay to make it play at around the same time that you’re reading about it. I’ve said before that text with a soundtrack always feels a little weird to me, due to the confusion of levels involved, of trying to stimulate both the senses and the imagination at the same time. But for this game, it might be the right kind of weird. It’s unsettling, it pulls you out of the text, and that’s appropriate to the context, in which you’re supposed to be reading that text inside a haunted building. I’ve made a great deal of progress since my last post, even though most of my playtime has been spent wandering around stuck due to missed hotspots. I found that important cellar I was looking for — as I had guessed, it was behind a hotspot I had missed. Just before stopping for the day, I finally found the subtitular Journal, which basically gives me all the remaining backstory. It was behind a particularly galling locked door. The way through this door was obvious: it was the old chestnut where they key is still in the keyhole on the other side of the door, so you poke it out and catch it with a sheet of paper slid underneath. (How is the room locked from the inside when there’s no one in it? I blame the ghosts.) The problem is that the game recognizes only one item as being capable of poking a key out of a keyhole, and that one item was on the other side of a hotspot I had missed. The galling part is that the whole environment was littered with plausible poking devices — pencils, pushpins, the chopsticks in Polly and Nigel’s Chinese take-out — which couldn’t even be tried because they were scenery items. Even worse, I had in my inventory another key for a different room of the hotel. Presumably it wouldn’t turn in the lock, but you’d think it would at least fit in. This is the sort of thing that text adventures usually handle a lot better than graphic adventures. Even if a text game just told you “That doesn’t fit” for each of the non-approved items, it would at least give you the satisfaction of acknowledging the attempt. The cellar holds a doubly-secret passage to what is clearly the end-of-game room. Just getting into that passage involved putting together some information that I had previously thought to be merely atmospheric, and the passage itself is barred by three layers of floating glowing runes that function as mystical combination locks. I solved one of these locks the right way, but I brute-forced my way through the other two, because I was at the time otherwise stuck and didn’t have any better ideas. Brute-forcing a combination is mindless and unsatisfying, but so is searching for hotspots, and iterating through combinations is at least guaranteed to work eventually. Indeed, when you have only four floating runes in front of you, and reasonably assume that each is used at most once in the combination, you have only 24 possibilities to try. Nonetheless, this felt cheaty enough that I went back to an earlier save afterward to try to solve the runes as intended — but only after getting to the final room and seeing how it worked. I still have more to do back in the hotel before I can execute the end-of-game ritual, but at least I learned a thing or two. So once again I’m doing things in the wrong order, but at least this time I’m doing it consciously and deliberately. Now, about that endgame. Although it isn’t obvious about it at first, Dark Fall is a treasure hunt at heart. There is a set of twelve runes written on scraps of parchment, and an associated magic word for each one, and you need to find them all. Often the rune and its incantation are found together, but sometimes they aren’t. I had been finding them haphazardly throughout the game, long before I knew what they were for or why they had been hidden. As such, the runes and words I’ve found are in my notes. But now, it seems like all I’ll really need is the words. You’re expected to type those in, so you have to know what they are. The runes become activated just as a result of finding them. This is not the only place where you can type in words. There are a few ghosts you can talk to with typed words, including one that responds via Ouija. It took me a while to notice this, though. The talk prompt, like those hotspots I was complaining about, is easy to miss. The game’s documentation doesn’t seem to mention typing at all, and it uses a pretty weird UI for it. It appears in the lower right, visible only as a button labeled “SAY” or “ASK”. Your typed text appears to the left of this, and is right-aligned, so it moves leftward as you type it. When you’re done typing a query, you have to press the button with your cursor. It took me a while to realize that pressing the Enter key on your keyboard like you would in a normal text-entry interface does nothing. The result is that you have to keep moving your hand between mouse and keyboard, which isn’t ideal. If you typed something the ghost recognizes, your text disappears. If you didn’t, it doesn’t. I hope the sequels changed some of this, if they use a text entry interface at all. Anyway, despite my best attempts, I have yet to get any useful information by conversing with ghosts. It is very much a guessing-game, and most guesses either are unrecognized or don’t go anywhere. It reminds me why guess-the-keyword has lost favor in text adventures, giving way to choice-based dialogue or suggested keyword lists. Maybe this aspect of the game will turn out to be non-crucial. Even if they do have useful things to say, a lot of the important clues in the game can be obtained from multiple sources. But I think it likely that I’ll need to get a word and/or rune directly from at least one of them — probably the Ouija ghost, because that one can show me the spelling. Okay, the last post may have been overly harsh. The author actually does want the player to exhaustively search the hotel rooms, even the unoccupied ones, which, although less dense in pokable detail, do have a few important things hidden in them. Certainly there doesn’t seem to be any way to identify the door that the key from the teapot unlocks other than by just trying all the doors. And that’s actually a fairly good bit of player-manipulation, if I read the intent correctly, because it means you’ll have done a reasonable amount of exploring before opening it, and be all the more impressed with what you find as a result. In addition, this room contains the game’s neatest gimmick: the goggles. I didn’t notice them at first, because they’re somewhat hidden, but they’re mentioned so often in the ghosthunters’ data that I searched the room again just to find them, and I’m glad I did. They’re some kind of high-tech electromagnetic imaging goggles, and when activated, they surround the cursor with a greenish binoculars-shaped aura that reveals things. With it, you can see the pictures that used to be on the walls, furniture that isn’t there any more, and spectral graffiti from some mad soul. But only a little bit at a time — reading the graffiti means waving the cursor over an entire wall to reveal as much as the aura covers while the rest of the wall stays normal. It’s a nice effect, and gives the scenes an interactivity beyond clicking on hotspots. It only works in certain specific places, though, and those places are hinted by a ghostly voice whispering “Here”. This seems like a cheat on the part of the designer. I know I’ve seen other games with similar mechanisms that can be applied anyplace, but I guess two versions of every single full-screen image was beyond this game’s budget. Polly and Nigel’s notes on their investigation raise a couple of big questions. One is the matter of the cellar. Nigel in particular seems to have done most of his investigating down there, and it’s where he made some sort of vague but amazing discovery. It’s clearly an important place, but I haven’t seen any sort of cellar entrance at all. Maybe it’s only accessible from one of the few still-locked doors, but it’s also possible that I’ve just missed a hotspot somewhere, and knowledge of that possibility bothers me. The other thing that puzzles me is the way that the two of them had to work for days to get even the slightest hint of ghost activity. My experience is that the whole place is a thick stew of ghosts, with disembodied voices or other phenomena in nearly every room — heck, the first ghost started talking to me before I even reached the station proper. Maybe this is just one of those ludonarrative dissonance things, with stuff happening more quickly than makes story-sense for game’s sake, like how the hero in a CRPG takes a matter of days to become the greatest warrior in the world and solve problems that baffled the greatest NPC minds for centuries. Or maybe there’s an in-story explanation. Either the player character is unusually sensitive to this stuff for mysterious but probably destined reasons, or there’s just been a sudden spike in manifestations, probably caused by whatever Nigel unearthed in the cellar. We’ll see.